American Idol’s Taryn Southern was directed by Todd Strauss-Schulson in “Private High Musical”. A brand new music-driven pilot titled “Zombies & Cheerleaders” has been ordered by Disney Channel, and the casting directors are looking at talent nationwide for the starring roles in the show. Non Los Angeles actors are submitting video auditions, and many roles are high school student age, however some roles are as young as 7 and as old as 40’s. Numerous actors and extras to portray students, parents, and faculty will also be hired. Shooting starts in December at the Los Angeles Center Studios, will take a holiday season break, and continue in January, 2012. American Idol season six winner Jordin Sparks plays the starring role of Sparkle Williams. Sony Pictures Entertainment will be shooting a remake of the music-themed 1976 film “Sparkle” inspired by the story of The Supremes. The extras casting director needs to hire over 3,000 background actors to work on the film in the Detroit, Michigan area this Fall, 2011. All ages and types are needed, no experience is necessary, this is fully paid employment, and there no fees to apply or work on the film. Columbia TriStar Pictures will distribute. The popular Dutch talent show ‘The Voice of Holland’ now has an American counterpart. 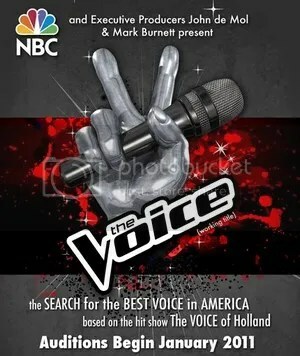 NBC is searching for the 2011 best Voice of America, and open casting calls now scheduled throughout the United States in January and February, 2011. The winner of this competition gets a recording contract with a major label.